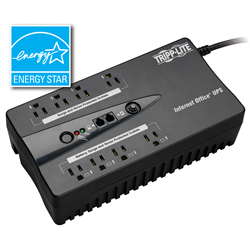 Let a Tripp Lite UPS protect you DVR, NVR, computer or network equipment from surges, brownouts and blackouts. When power dips or fails, the UPS will provide 120V power from its battery to keep equipment up and running, preventing data loss and main board and hard drive damage. The battery typically lasts for 2-4 years and are user replaceable when they can no longer hold a suitable charge.